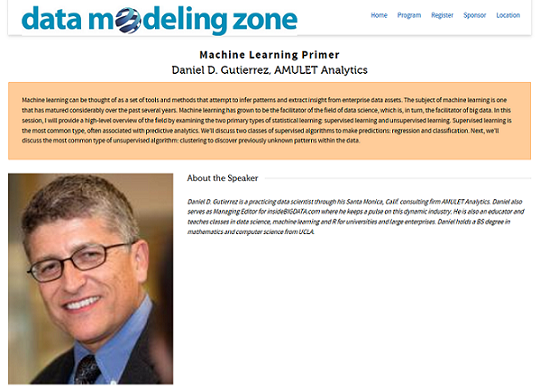 I am looking forward to conducting two sessions for the upcoming Data Modeling Zone conference on Oct. 17-19 in Portland, OR. My half-day session “Data Science Primer” is Tuesday morning, Oct. 18 and my short session “Machine Learning Primer” is Wednesday morning, Oct. 19. My book publisher, Technics Publications is the host of the event and I will be doing a book signing during the show.